If you're in the Derby area looking for a bespoke designed quality bathroom fitted with every care to ensure your ultimate luxury bathroom or en-suite facilities, whilst at the same time meeting your budgetary requirements, then Oasis Bathrooms Derby is the company of choice to meet your needs. We can provide a complete service from providing a quotation, planning and designing your new room, removing your old suite and adding finishing touches like hiding pipes and custom storage solutions and cloakrooms. In summary as our logo reads, we provide a design, the concept and install. We only use fittings and fixtures from quality suppliers, from the medium price range to top quality. Take a look at our portfolio to see some of our recent work. 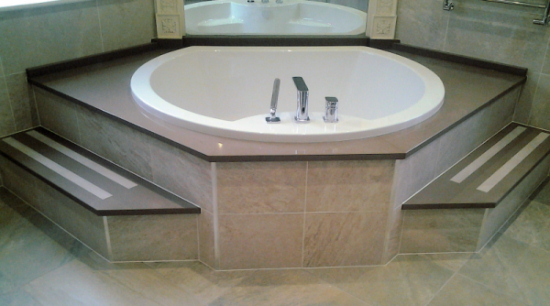 All of the pictures in our portfolio are genuine work carried out by Oasis bathrooms. As we are based in Derby we tend to work in the Derby area but also have a base near Alfreton in Derbyshire. Therefore our work tends to come from Derby, the surrounding area and the central region of Derbyshire. We look forward to hearing from you soon to help you create your dream bathroom. at the price we say we're going do it for!